"Tyndale" redirects here. For the English family, see Tyndall. For other uses, see Tyndale (disambiguation). 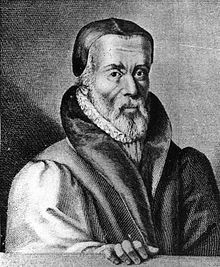 William Tyndale (/ˈtɪndəl/; sometimes spelled Tynsdale, Tindall, Tindill, Tyndall; c. 1494 – c. 6 October 1536) was an English scholar who became a leading figure in the Protestant Reformation in the years leading up to his execution. He is well known for his translation of the Bible into English. He was influenced by the work of Desiderius Erasmus, who made the Greek New Testament available in Europe, and by Martin Luther. A number of partial translations had been made from the seventh century onward, but the spread of Wycliffe's Bible in the late 14th century led to the death penalty for anyone found in unlicensed possession of Scripture in English, although translations were available in all other major European languages. 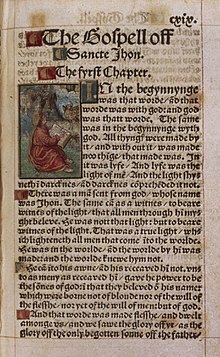 Tyndale's translation was the first English Bible to draw directly from Hebrew and Greek texts, the first English translation to use Jehovah ("Iehouah") as God's name as preferred by English Protestant Reformers, the first English translation to take advantage of the printing press, and first of the new English Bibles of the Reformation. It was taken to be a direct challenge to the hegemony of both the Catholic Church and the laws of England maintaining the church's position. In 1530, Tyndale also wrote The Practyse of Prelates, opposing Henry VIII's annulment of his own marriage on the grounds that it contravened Scripture. Reuchlin's Hebrew grammar was published in 1506. Tyndale worked in an age in which Greek was available to the European scholarly community for the first time in centuries. Erasmus compiled and edited Greek Scriptures following the Fall of Constantinople in 1453. Constantinople's fall helped to fuel the Renaissance and led to the dispersion of Greek-speaking intellectuals and texts into a Europe which previously had no access to them. A copy of Tyndale's The Obedience of a Christian Man fell into the hands of Henry VIII, providing the king with the rationale to break the Church in England from the Catholic Church in 1534. In 1535, Tyndale was arrested and jailed in the castle of Vilvoorde (Filford) outside Brussels for over a year. In 1536, he was convicted of heresy and executed by strangulation, after which his body was burnt at the stake. His dying prayer was that the King of England's eyes would be opened; this seemed to find its fulfillment just one year later with Henry's authorization of the Matthew Bible, which was largely Tyndale's own work - missing sections supplemented with translations by John Rogers and Miles Coverdale. Following this came the Great Bible and then the Bishop's Bible, authorized by the church of England. Hence, the work of Tyndale continued to play a key role in spreading Reformation ideas across the English-speaking world and, eventually, to the British Empire. In 1611, the 47 scholars who produced the King James Bible drew significantly from Tyndale's work, the Matthew Bible, as well as from translations that descended from his. One estimate suggests that the New Testament in the King James Version is 83% Tyndale's and the Old Testament 76%. His translation of the Bible was the first to be printed in English and to be translated from the original languages to English; it became a model for subsequent English translations. In 2002, Tyndale was placed at number 26 in the BBC's poll of the 100 Greatest Britons. Tyndale was born around the year 1494[a] in Melksham Court, Stinchcombe, a village near Dursley, Gloucestershire. The Tyndale family also went by the name Hychyns (Hitchins), and it was as William Hychyns that Tyndale was enrolled at Magdalen Hall, Oxford. Tyndale's family had moved to Gloucestershire at some point in the 15th century, probably as a result of the Wars of the Roses. The family originated from Northumberland via East Anglia. Tyndale's brother Edward was receiver to the lands of Lord Berkeley, as attested to in a letter by Bishop Stokesley of London. Tyndale is recorded in two genealogies as having been the brother of Sir William Tyndale of Deane, Northumberland and Hockwold, Norfolk, who was knighted at the marriage of Arthur, Prince of Wales to Catherine of Aragon. Tyndale's family was thus descended from Baron Adam de Tyndale, a tenant-in-chief of Henry I (see Tyndall). William Tyndale's niece Margaret Tyndale was married to Protestant martyr Rowland Taylor, burnt during the Marian Persecutions. They have ordained that no man shall look on the Scripture, until he be noselled in heathen learning eight or nine years and armed with false principles, with which he is clean shut out of the understanding of the Scripture. He was a gifted linguist and became fluent over the years in French, Greek, Hebrew, German, Italian, Latin, and Spanish, in addition to English. Between 1517 and 1521, he went to the University of Cambridge. Erasmus had been the leading teacher of Greek there from August 1511 to January 1512, but not during Tyndale's time at the university. Tyndale became chaplain at the home of Sir John Walsh at Little Sodbury and tutor to his children around 1521. His opinions proved controversial to fellow clergymen, and the next year he was summoned before John Bell, the Chancellor of the Diocese of Worcester, although no formal charges were laid at the time. After the meeting with Bell and other church leaders, Tyndale, according to John Foxe, had an argument with a "learned but blasphemous clergyman", who allegedly asserted: "We had better be without God's laws than the Pope's. ", to which Tyndale responded: "I defy the Pope, and all his laws; and if God spares my life, ere many years, I will cause the boy that driveth the plow to know more of the Scriptures than thou dost!" Tyndale left for London in 1523 to seek permission to translate the Bible into English. He requested help from Bishop Cuthbert Tunstall, a well-known classicist who had praised Erasmus after working together with him on a Greek New Testament. The bishop, however, declined to extend his patronage, telling Tyndale that he had no room for him in his household. Tyndale preached and studied "at his book" in London for some time, relying on the help of cloth merchant, Humphrey Monmouth. During this time, he lectured widely, including at St Dunstan-in-the-West. The beginning of the Gospel of John, from Tyndale's 1525 translation of the New Testament. Tyndale left England and landed on continental Europe, perhaps at Hamburg, in the spring of 1524, possibly travelling on to Wittenberg. There is an entry in the matriculation registers of the University of Wittenberg of the name "Guillelmus Daltici ex Anglia", and this has been taken to be a Latinisation of "William Tyndale from England". He began translating the New Testament at this time, possibly in Wittenberg, completing it in 1525 with assistance from Observant friar William Roy. In 1525, publication of the work by Peter Quentell in Cologne was interrupted by the impact of anti-Lutheranism. A full edition of the New Testament was produced in 1526 by printer Peter Schöffer in Worms, a free imperial city then in the process of adopting Lutheranism. More copies were soon printed in Antwerp. The book was smuggled into England and Scotland; it was condemned in October 1526 by Bishop Tunstall, who issued warnings to booksellers and had copies burned in public. Marius notes that the "spectacle of the scriptures being put to the torch... provoked controversy even amongst the faithful." Cardinal Wolsey condemned Tyndale as a heretic, first stated in open court in January 1529. From an entry in George Spalatin's Diary for 11 August 1526, Tyndale apparently remained at Worms for about a year. It is not clear exactly when he moved to Antwerp. The colophon to Tyndale's translation of Genesis and the title pages of several pamphlets from this time purported to have been printed by Hans Luft at Marburg, but this is a false address. Hans Luft, the printer of Luther's books, never had a printing press at Marburg. Tyndale, before being strangled and burned at the stake in Vilvoorde, cries out, "Lord, open the King of England's eyes". 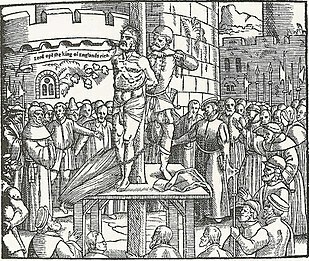 Woodcut from Foxe's Book of Martyrs (1563). It is possible that Tyndale intended to carry on his work from Hamburg in about 1529. He revised his New Testament and began translating the Old Testament and writing various treatises. In 1530, he wrote The Practyse of Prelates, opposing Henry VIII's planned annulment of his marriage to Catherine of Aragon in favour of Anne Boleyn, on the grounds that it was unscriptural and that it was a plot by Cardinal Wolsey to get Henry entangled in the papal courts of Pope Clement VII. The king's wrath was aimed at Tyndale. Henry asked Emperor Charles V to have the writer apprehended and returned to England under the terms of the Treaty of Cambrai; however, the Emperor responded that formal evidence was required before extradition. Tyndale developed his case in An Answer unto Sir Thomas More's Dialogue. Eventually, Tyndale was betrayed by Henry Phillips to the imperial authorities, seized in Antwerp in 1535, and held in the castle of Vilvoorde (Filford) near Brussels. Some suspect that Phillips was hired by Bishop Stokesley to gain Tyndale’s confidence and then betray him. He was tried on a charge of heresy in 1536 and was condemned to be burned to death, despite Thomas Cromwell's intercession on his behalf. Tyndale "was strangled to death while tied at the stake, and then his dead body was burned". His final words, spoken "at the stake with a fervent zeal, and a loud voice", were reported as "Lord! Open the King of England's eyes." The traditional date of commemoration is 6 October, but records of Tyndale's imprisonment suggest that the actual date of his execution might have been some weeks earlier. Foxe gives 6 October as the date of commemoration (left-hand date column), but gives no date of death (right-hand date column). Biographer David Daniell states the date of death only as "one of the first days of October 1536". Within four years, four English translations of the Bible were published in England at the King's behest,[b] including Henry's official Great Bible. All were based on Tyndale's work. Tyndale denounced the practice of prayer to saints. He also rejected the Roman Catholic view that the Scriptures could only be read and interpreted by approved clergy, famously defying the Pope by crying, "I defie the Pope and all his lawes. If God spare my life, ere many yeares I wyl cause a boy that driveth the plough to know more of the Scripture, than he doust." Although best known for his translation of the Bible, Tyndale was also an active writer and translator. As well as his focus on the ways in which religion should be lived, he had a focus on political issues. 1849* Expositions and Notes on Sundry Portions of the Holy Scriptures Together with the Practice of Prelates, edited by Henry Walter. 1850* An Answer to Sir Thomas More's Dialogue, The Supper of the Lord after the True Meaning of John VI. and I Cor. XI., and William Tracy's Testament Expounded, edited by Henry Walter. * These works were printed more than once, usually signifying a revision or reprint. However the 1525 edition was printed as an incomplete quarto and was then reprinted in 1526 as a complete octavo. ** These works were reprints of Tyndale's earlier translations revised for modern spelling. Coinage of the word atonement (a concatenation of the words 'At One' to describe Christ's work of restoring a good relationship—a reconciliation—between God and people) is also sometimes ascribed to Tyndale. However, the word was probably in use by at least 1513, before Tyndale's translation. Similarly, sometimes Tyndale is said to have coined the term mercy seat. While it is true that Tyndale introduced the word into English, mercy seat is more accurately a translation of Martin Luther's German Gnadenstuhl. The hierarchy of the Catholic Church did not approve of some of the words and phrases introduced by Tyndale, such as "overseer", where it would have been understood as "bishop", "elder" for "priest", and "love" rather than "charity". Tyndale, citing Erasmus, contended that the Greek New Testament did not support the traditional readings. More controversially, Tyndale translated the Greek ekklesia (Greek: εκκλησία), (literally "called out ones") as "congregation" rather than "church". It has been asserted this translation choice "was a direct threat to the Church's ancient — but so Tyndale here made clear, non-scriptural — claim to be the body of Christ on earth. To change these words was to strip the Church hierarchy of its pretensions to be Christ's terrestrial representative, and to award this honor to individual worshippers who made up each congregation." Tyndale was accused of errors in translation. Thomas More commented that searching for errors in the Tyndale Bible was similar to searching for water in the sea, and charged Tyndale's translation of The Obedience of a Christian Man with having about a thousand false translations. Bishop Tunstall of London declared that there were upwards of 2,000 errors in Tyndale's Bible, having already in 1523 denied Tyndale the permission required under the Constitutions of Oxford (1409), which were still in force, to translate the Bible into English. In response to allegations of inaccuracies in his translation in the New Testament, Tyndale in the Prologue to his 1525 translation wrote that he never intentionally altered or misrepresented any of the Bible, but that he had sought to "interpret the sense of the scripture and the meaning of the spirit." While translating, Tyndale followed Erasmus's (1522) Greek edition of the New Testament. In his preface to his 1534 New Testament ("WT unto the Reader"), he not only goes into some detail about the Greek tenses but also points out that there is often a Hebrew idiom underlying the Greek. The Tyndale Society adduces much further evidence to show that his translations were made directly from the original Hebrew and Greek sources he had at his disposal. For example, the Prolegomena in Mombert's William Tyndale's Five Books of Moses show that Tyndale's Pentateuch is a translation of the Hebrew original. His translation also drew on the Latin Vulgate and Luther's 1521 September Testament. Of the first (1526) edition of Tyndale's New Testament, only three copies survive. The only complete copy is part of the Bible Collection of Württembergische Landesbibliothek, Stuttgart. The copy of the British Library is almost complete, lacking only the title page and list of contents. Another rarity is Tyndale's Pentateuch, of which only nine remain. The translators of the Revised Standard Version in the 1940s noted that Tyndale's translation, including the 1537 Matthew Bible, inspired the translations that followed: The Great Bible of 1539; the Geneva Bible of 1560; the Bishops' Bible of 1568; the Douay-Rheims Bible of 1582–1609; and the King James Version of 1611, of which the RSV translators noted: "It [the KJV] kept felicitous phrases and apt expressions, from whatever source, which had stood the test of public usage. It owed most, especially in the New Testament, to Tyndale". Moynahan writes: "A complete analysis of the Authorised Version, known down the generations as "the AV" or "the King James" was made in 1998. It shows that Tyndale's words account for 84% of the New Testament and for 75.8% of the Old Testament books that he translated." Joan Bridgman makes the comment in the Contemporary Review that, "He [Tyndale] is the mainly unrecognised translator of the most influential book in the world. Although the Authorised King James Version is ostensibly the production of a learned committee of churchmen, it is mostly cribbed from Tyndale with some reworking of his translation." Many of the English versions since then have drawn inspiration from Tyndale, such as the Revised Standard Version, the New American Standard Bible, and the English Standard Version. Even the paraphrases like the Living Bible have been inspired by the same desire to make the Bible understandable to Tyndale's proverbial ploughboy. George Steiner in his book on translation After Babel refers to "the influence of the genius of Tyndale, the greatest of English Bible translators..." [After Babel p. 366]. He has also appeared as a character in two plays dealing with the King James Bible, Howard Brenton's Anne Boleyn (2010) and David Edgar's Written on the Heart (2011). A memorial to Tyndale stands in Vilvoorde, Flanders, where he was executed. It was erected in 1913 by Friends of the Trinitarian Bible Society of London and the Belgian Bible Society. There is also a small William Tyndale Museum in the town, attached to the Protestant church. A bronze statue by Sir Joseph Boehm commemorating the life and work of Tyndale was erected in Victoria Embankment Gardens on the Thames Embankment, London in 1884. It shows his right hand on an open Bible, which is itself resting on an early printing press. The Tyndale Monument was built in 1866 on a hill above his supposed birthplace, North Nibley, Gloucestershire. A stained-glass window commemorating Tyndale was made in 1911 for the British and Foreign Bible Society by James Powell and Sons. In 1994, when the Society moved their offices, the window was reinstalled in the chapel of Hertford College. Tyndale was at Magdalen Hall, Oxford, which became Hertford College in 1874. The window depicts a full-length portrait of Tyndale, a cameo of a printing shop in action, some words of Tyndale, the opening words of Genesis in Hebrew, the opening words of John's Gospel in Greek, and the names of other pioneering Bible translators. The portrait is based on the oil painting that hangs in the college's dining hall. A stained glass window by Arnold Robinson in Tyndale Baptist Church, Bristol also commemorates the life of Tyndale. A number of colleges, schools and study centres have been named in his honour, including Tyndale House (Cambridge), Tyndale University College and Seminary (Toronto), the Tyndale-Carey Graduate School affiliated to the Bible College of New Zealand, William Tyndale College (Farmington Hills, Michigan), and Tyndale Theological Seminary (Shreveport, Louisiana, and Fort Worth, Texas), the independent Tyndale Theological Seminary in Badhoevedorp, near Amsterdam, The Netherlands, Tyndale Christian School in South Australia and Tyndale Park Christian School in New Zealand. An American Christian publishing house, also called Tyndale House, was named after Tyndale. A life-sized bronze statue of a seated William Tyndale at work on his translation by Lawrence Holofcener (2000) was placed in the Millennium Square, Bristol, United Kingdom. In 2008, vandals attacked the statue, which was taken away, repaired, and reinstalled. There is an Anglican communion setting in memoriam William Tyndale, The Tyndale Service, by David Mitchell. See the List of Anglican Church Calendars. Tyndale is also honoured in the Calendar of Saints of the Evangelical Lutheran Church in America as a translator and martyr the same day. The first biographical film about Tyndale, titled William Tindale, was released in 1937. The second, titled God's Outlaw: The Story of William Tyndale, was released in 1986. A cartoon film about his life, titled Torchlighters: The William Tyndale Story, was released ca. 2005. The film Stephen's Test of Faith (1998) includes a long scene with Tyndale, how he translated the Bible and how he was put to death. The documentary film, William Tyndale: Man with a Mission, was released ca. 2005. The movie included an interview with David Daniell. Another known documentary is the film William Tyndale: His Life, His Legacy. The 2-hour Channel 4 documentary, The Bible Revolution, presented by Rod Liddle, details the roles of historically significant English Reformers John Wycliffe, William Tyndale, and Thomas Cranmer. The "Battle for the Bible" (2007) episode of the PBS Secrets of the Dead series, narrated by Liev Schreiber, features Tyndale's story and legacy and includes historical context. This film is an abbreviated and revised version of the PBS/Channel 4 version, and replaces some British footage with that more relevant to American audiences. In 2011, BYUtv produced a miniseries on the creation of the King James Bible that focused heavily on Tyndale's life called Fires of Faith. Tyndale was writing at the beginning of the Early Modern English period. His pronunciation must have differed in its phonology from that of Shakespeare at the end of the period. The linguist David Crystal has made a transcription and a sound recording of Tyndale's translation of the whole of Saint Matthew's Gospel in what he believes to be the pronunciation of the day, using the term "original pronunciation". The recording has been published by The British Library on two compact discs with an introductory essay by Crystal. ^ Tyndale's birth was about 1494 according to History of the Revised Version in 1881. ^ Miles Coverdale's, Thomas Matthew's, Richard Taverner's, and the Great Bible. ^ "Tyndale". Random House Webster's Unabridged Dictionary. ^ Partridge 1973, pp. 38–39, 52–52. ^ Marshall 2017, p. 117. ^ In the 7th paragraph of Introduction to the Old Testament of the New English Bible, Sir Godfry Driver wrote, "The early translators generally substituted 'Lord' for [YHWH]. [...] The Reformers preferred Jehovah, which first appeared as Iehouah in 1530 A.D., in Tyndale's translation of the Pentateuch (Exodus 6.3), from which it passed into other Protestant Bibles." ^ Bourgoin 1998, p. 373. ^ Daniell & Noah 2004. ^ Daniell 1994, p. [page needed]. ^ Harding, Nathan (15 January 2019). "Christ Lost in the Word: A history of the Matthew Bible". www.thematthewbible.com/purchase. Retrieved 15 January 2019. ^ Tadmor 2010, p. 16. ^ Nielson & Skousen 1998. ^ Parrill & Robison 2013, p. 93. ^ "William Tyndale", Historical Figures, BBC, retrieved 25 January 2014 . ^ Demaus 1886, p. 21. ^ John Nichol, "Tindal genealogy", Literary Anecdotes, 9 . ^ Moynahan 2003, p. 11. ^ Daniell 1994, p. 18. ^ Daniell 2001, pp. 49–50. ^ Moynahan 2003, p. 28. ^ Wansbrough, Dom Henry OSB MA (Oxon) STL LSS, Lecture, Oxford . ^ Foxe, "Chap XII" , Book of Martyrs . ^ Tyndale, William (1530), "Preface", Five bokes of Moses . ^ Samworth, Herbert (2017). "Reformers | Tyndale's Ploughboy". tyndalesploughboy.org. Retrieved 6 February 2018. ^ Cochlaeus, Joannes (1549), Commentaria de Actis et Scriptis Martini Lutheri [Commentary on Acts and Martin Luther’s writings] (in Latin), St Victor, near Mainz: Franciscus Berthem, p. 134 . ^ a b Ackroyd, Peter (1999), The Life of Thomas More, London, p. 270 . ^ Moynahan 2003, p. 177. ^ "Antwerpen, Hamburg, Antwerpen", Tyndale (biography) (in German) . ^ Marius, Richard (1999), Thomas More: A Biography, Cambridge, MA, p. 388, ...English kings on one side and the wicked popes and English bishops on the other. Cardinal Wolsey embodies the culmination of centuries of conspiracy, and Tyndale's hatred of Wolsey is so nearly boundless that it seems pathological. ^ Bellamy, JG (1979), The Tudor Law of Treason: An Introduction, London, p. 89, Henry claimed that Tyndale was spreading sedition, but the Emperor expressed his doubts and argued that he must examine the case and discover proof of the English King's assertion before delivering the wanted man. ^ "Full text of "An answer to Sir Thomas More's Dialogue, The supper of the Lord, after the true meaning of John VI. and 1 Cor. XI., and Wm. Tracy's Testament expounded"". ^ Edwards, Brian H. (1987). "Tyndale's Betrayal and Death". Christianity Today (16). Retrieved 23 April 2015. ^ a b Foxe 1570, p. VIII.1228. ^ "William Tyndale—A Man of Vision". The Watchtower. Vol. 116 no. 22. 15 November 1995. ISSN 2325-5838. Retrieved 11 March 2019. ^ Farris, Michael (2007), From Tyndale to Madison, p. 37 . ^ Foxe 1570, p. VIII. 1229. ^ a b Daniell 2001, p. 383. ^ Arblaster, Paul (2002). "An Error of Dates?". Archived from the original on 27 September 2007. Retrieved 7 October 2007. ^ Hamlin & Jones 2010, p. 336. ^ Gutenberg, William Tyndale at Project. "William Tyndale - Wikiquote". en.wikiquote.org. Retrieved 26 March 2019. ^ Tyndale, William, The Obedience of a Christian Man . ^ a b c Cooper 1899, p. 247. ^ Andreasen, Niels-erik A (1990), "Atonement/Expiation in the Old Testament", in Mills, WE (ed. ), Dictionary of the Bible, Mercer University Press . ^ McGrath, Alister E (2001), Christian literature: an anthology, Wiley-Blackwell, p. 357 . ^ Gillon, Campbell (1991), Words to Trust, Rowman & Littlefield, p. 42 . ^ "atonement", OED, 1513 MORE Rich. III Wks. 41 Having more regarde to their olde variaunce then their newe attonement. [...] 1513 MORE Edw. V Wks. 40 Of which… none of vs hath any thing the lesse nede, for the late made attonemente. ^ Harper, Douglas, "atone", Online Etymology Dictionary . ^ Shaheen, Naseeb (1999), Biblical references in Shakespeare's plays, University of Delaware Press, p. 18 . ^ Moo, Douglas J (1996), The Epistle to the Romans, William B Eerdmans, p. 232 n. 62 . ^ "Rev 22:17", Believer's Study Bible (electronic ed. ), Nashville: Thomas Nelson, 1997, the word ... ekklesia ... is a compound word coming from the word kaleo, meaning 'to call,' and ek, meaning 'out of'. Thus... 'the called-out ones'. Eph 5:23, "This is the same word used by the Greeks for their assembly of citizens who were 'called out' to transact the business of the city. The word ... implies ... 'assembly'. ^ a b c d Moynahan 2003, p. 72. ^ Tyndale, William. "Tyndale's New Testament (Young.152)". Cambridge Digital Library. Retrieved 19 July 2016. ^ Moynahan 2003, pp. 1–2. ^ Bridgman, Joan (2000), "Tyndale's New Testament", Contemporary Review, 277 (1619): 342–46 . ^ The Bible in the Renaissance – William Tyndale, Oxford . ^ Foxe, John, "XII" , The Book of Martyrs . ^ Le Chrétien Belge, 18 October 1913; 15 November 1913. ^ Tyndale Theological Seminary, EU . ^ Tyndale park, NZ: School . ^ "Vandals attack Bristol statue", Bristol Post, UK: This is Bristol, 27 August 2008, retrieved 31 August 2013 . ^ Hatchett, Marion J (1981), Commentary on the American Prayer Book, New York: Seabury, pp. 43, 76–77 . ^ Martin, Draper, ed. (1982), The Cloud of Witnesses: A Companion to the Lesser Festivals and Holydays of the Alternative Service Book, 1980, London: The Alcuin Club . ^ "William Tyndale: His Life, His Legacy". TBN. KTBN TV. ASIN B000J3YOBO. Archived from the original on 23 September 2012. ^ Melvyn Bragg. "The Most Dangerous Man in Tudor England". BBC Two. ^ Tyndale, William (2013), Crystal, David (ed. ), Bible, St Matthew's Gospel, read in the original pronunciation, The British Library, ISBN 978-0-7123-5127-0, NSACD 112-113 . Arblaster, Paul; Juhász, Gergely; Latré, Guido, eds. (2002), Tyndale's Testament (hardback)|format= requires |url= (help), Brepols, ISBN 2-503-51411-1 . Bourgoin, Suzanne Michele (1998). Encyclopedia of World Biography: Studi-Visser. Vol 15. Gale Research. ISBN 978-0-7876-2555-9. Cahill, Elizabeth Kirkl (1997), "A bible for the plowboy", Commonweal, 124 (7) . Daniell, David (1994), William Tyndale: A Biography, New Haven, CT & London: Yale University Press . Daniell, David (2001) , William Tyndale: A Biography, New Haven, CT: Yale University Press, p. 382–383, ISBN 978-0-300-06880-1 . Daniell, David (May 2011), "Tyndale, William (c.1494–1536)", Oxford Dictionary of National Biography (online ed. ), Oxford University Press, doi:10.1093/ref:odnb/27947 (Subscription or UK public library membership required. ), The first edition of this text is available at Wikisource: "Tyndale, William" . Dictionary of National Biography. 57. 1899. Demaus, Robert (1886). William Tyndale, a Biography: A Contribution to the Early History of the English Bible. London: Religious Tract Society. Day, John T (1993), "Sixteenth-Century British Nondramatic Writers", Dictionary of Literary Biography, 1 (132), pp. 296–311 . Foxe, John (1570), "Acts and Monuments", Book of Martyrs Variorum, HRI . Marshall, Peter (2017). Heretics and Believers: A History of the English Reformation. Yale University Press. ISBN 0300170629. Nielson, Jon; Skousen, Royal (2015). "How Much of the King James Bible Is William Tyndale's?". Reformation. 3 (1): 49–74. doi:10.1179/ref_1998_3_1_004. ISSN 1357-4175. Parrill, Sue; Robison, William B. (2013). The Tudors on Film and Television. McFarland. ISBN 978-1-4766-0031-4. Partridge, Astley Cooper (1973). English Biblical translation. London: Deutsch. Piper, John, Why William Tyndale Lived and Died, Desiring God Ministries . Reidhead, Julia, ed. (2006), The Norton Anthology: English Literature (8th ed. ), New York, NY, p. 621 . Tyndale, William (2000), O'Donnell, Anne M, SND; Wicks, Jared SJ (eds. ), An Answer Unto Sir Thomas Mores Dialoge, Washington, DC: Catholic University of America Press, ISBN 0-8132-0820-3 . Tyndale, William (2000) [Worms, 1526], The New Testament (original spelling reprint ed. ), The British Library, ISBN 0-7123-4664-3 . "William Tyndale: A hero for the information age", The Economist, pp. 101–3, 20 December 2008 . The online version corrects the name of Tyndale's Antwerp landlord as "Thomas Pointz" vice the "Henry Pointz" indicated in the print ed. This article incorporates text from a publication now in the public domain: Mombert, JI (1914). "Tyndale, William". In Jackson, Samuel Macauley (ed.). New Schaff–Herzog Encyclopedia of Religious Knowledge (third ed.). London and New York: Funk and Wagnalls. Wikimedia Commons has media related to William Tyndale. Wikisource has the text of the 1911 Encyclopædia Britannica article Tyndale, William. "William Tyndale", Find A Grave (entry) . "Tyndale", Secrets of the Dead (Documentary), PBS . Tyndale, William, Translation (cleartext) (download), Source forge .